Located in East London and commissioned by a Local Authority, this bespoke 3 bay Modular Building provides a modern and much needed workshop to enable the disabled to manufacture lightweight products. This Prefabricated Building provides a total floor area of 73 sq. metres and incorporates an open plan manufacturing area of circa 52 sq. metres, a self contained office, a fully equipped disabled toilet, a kitchen and a materials store. A hot/cold air conditioning system keeps the whole building at a constant temperature whilst the disabled workers enjoy a light, spacious and "SAFE" manufacturing environment. Externally, the main body of this Prefabricated Building is clad in "brick slips" on one hour fire rated walls. The roof is of a 15 degree pitch & finished with "Britmet" pantiles. All windows and doors are finished in polyester powder coated aluminium. 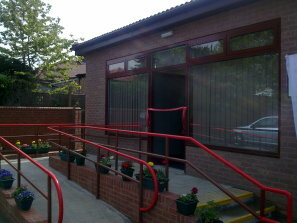 This Modular Building was manufactured, delivered, connected up and commissioned within eight weeks of order. The workers are delighted!